We began building the school with nothing and our only weapon was prayers to Jehovah. Now the school has been given a borehole, classrooms, pit latrines and a teachers’ house will be built and 100 opharns will be sponsored. Our next target is to get Breadfruit to starving rural households in Zambia. There is so much redtape and i will cover the import permit because the devil enjoys seeing suffering. Lets pray to melt down the resistance as i beg for the third time. Fruit Tree Farm yesterday. I spent it airating banana plants. There are young Mangoes, Pawpaws, Oranges, Guavas and am waiting for kamansi lira. 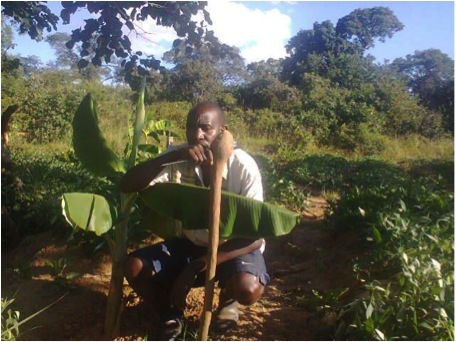 To raise a breadfruit nursery and distribute them among vulnerable households as a means of mitigation hunger. To grow Mangoes, Pawpaws, Guavas and Bananas to supply vulnerable households, schools and clinics around Kauwe, Nampuyani, Nguba and Singwamba with fruits in order to improve nutrition. We just have to do it for those poor and hungry old men, women and kids because we know what it means to be hungry and poor. The rich dont understand it because they have never been hungry.